This vault is full of the most important relics and artifacts related to the region of Bohemia. Discover Holy relics, royal swords, dynastic crowns, and many other treasures. It was carried to Bohemia in the second half of the XIII. century. Anna the duchess of Macho escaped from her brother Stephen V. and delivered half of the Royal treasury (with the Sword of St. Stephen) to Ottokar II. of Bohemia. Now it is amongst the treasures of St. Vitus cathedral in Prague. In 1303 she arrived in Prague and was crowned Czech and Polish queen. On this occasion she took the name Elizabeth or also Eliška. 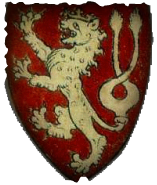 ﻿﻿The marriage being celebrated is that of Jan or John of Luxembourg, also known as John of Bohemia or John the Blind, and Princess Eliška Přemyslovna, the daughter of the last king of the Czech Přemyslid line. It took place on September 1, 1310, in the German city of Speyer after protracted negotiations. This is the wedding crown which formed part of the Bohemian royal treasure trove found at Sroda Slaska in 1985 in what is now Poland. The find, which included hundreds of Bohemian gold coins and jewellery, has been described as one of the most important discoveries of the 20th century. The marriage with Eliška soured. She was banished to Mělník castle, around 30 kilometres from Prague, while their first son, Václav, later renamed Charles in honour of the French king, was kept by his side and later sent to the French court to complete his education. 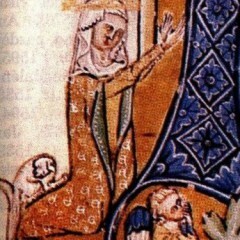 Eliška died in 1330 with Jan marrying a French princess, Beatrix, a few years later. 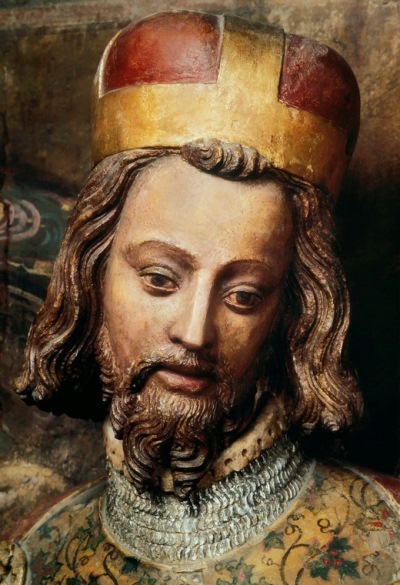 The Holy Roman Emperor Charles IV had it made in 1347 for his coronation and forthwith he dedicated it to the first patron saint of the country St. Wenceslas and bequeathed it as a state crown for the coronation of future Bohemian kings, his successors to the Bohemian throne. On the orders of Charles IV the new Royal Crown was to be permanently deposited in St. Vitus Cathedral in Prague Castle). It was used last time for the coronation of Bohemian King Ferdinand V in 1836. Today, the royal crown only is displayed every five years and are locked away in Prague Castle, only opened by the keys granted to several leaders of the Czech Republic. St. Wenceslas’ sword is part of Czech Royal Jewels together with Crown of Saint Wenceslas and other artifacts. It is thought to have been a coronation Sword. In the 19th century it was believed that it was an authentic weapon, the prevailing opinion at the beginning of the 20th century was that the sword was Gothic and that Charles IV probably replaced the similar older sword in the treasure of the Cathedral of St. Vitus that was mentioned in the articles of inventory from 1333. Jewels with sword are stored in St. Vitus Cathedral (Prague Castle). The Royal Apple in the hand of King Wenceslas IV. (O Lord, in Thy strength the king will be glad and in Thy salvation how greatly he will rejoice). The richly ornamented decorations feature predominantly precious stones and pearls, while the slight little figures of six sphinxes on the base of the cross form a charming detail. The gold, the red spinels, and the blue sapphires, in places emphasized by colourful enamel are striking in their harmony. The surface of both hemispheres is covered with an extremely precisely wrought relief of figures, thematically connected with the coronation. 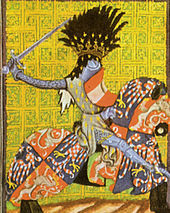 The Royal Sceptre was painted into many paintings, thus taking the place of a sword and shield like this image of Prince Vaclav. The Sceptre was forged of gold of equal purity as the Royal Apple. It is 67 cm long and weighs 1,013 grams. In the set of Crown Jewels, this Sceptre and Apple replaced older ones from the time of the rule of Charles IV. It is decorated with four sapphires, five spinels and sixty-two pearls. ​It consists of several differently shaped parts connected with rings, with a more striking feature of a row of pearls at the base of the handle. The entire surface of all the parts is covered by a finely engraved decoration whose dominant feature consists in the motive of vine tendrils, leaves, and flowers or acanthuses. Rudolph put Otakar II’s casket on display in Vienna before it was moved to a monastery in Znojmo, Moravia. The coffin, which contained Otakar’s crown and scepter, was transferred to Prague in 1296. The Crown of Otakar II. Following Otakar's death at the Battle of Marchfield, Rudolph put Otakar II’s casket on display in Vienna before it was moved to a monastery in Znojmo, Moravia. The coffin, which contained Otakar’s crown and scepter, was transferred to Prague in 1296, but was not placed in Saint Vitus’ Cathedral until 1373. 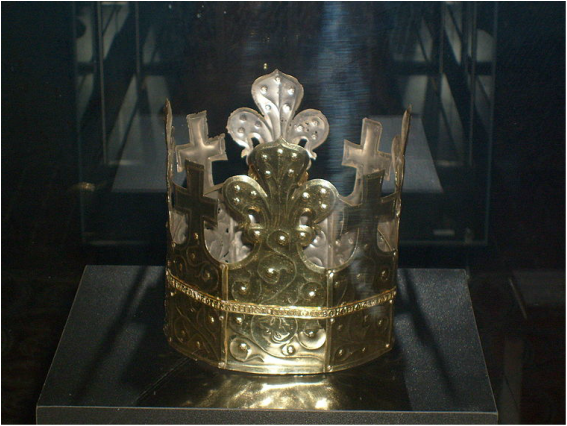 The crown of King Otakar II. is kept in the treasury of Prague Castle. Following the death of Prince Wenceslas but his brother, the holy relics were moved to several places but now rest in Czechia and brought to Stare Boleslav once a year for a ceremony. 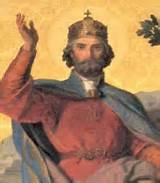 Soon after his death, Prince Wenceslas was worshiped as a martyr and his cult grew strong mainly in the 11th century. The place of his death became a popular pilgrimage site. 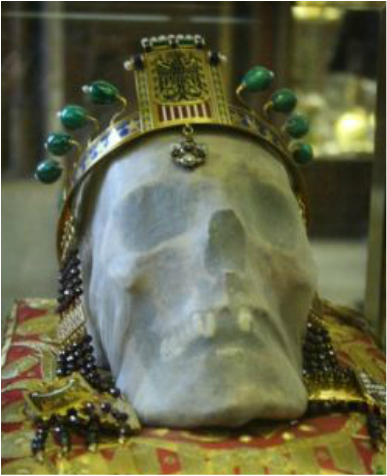 His skull, now a relic, has been scientifically dated to a near 1000 years ago.....about the time of his death at the hands of his brother, Boleslav. 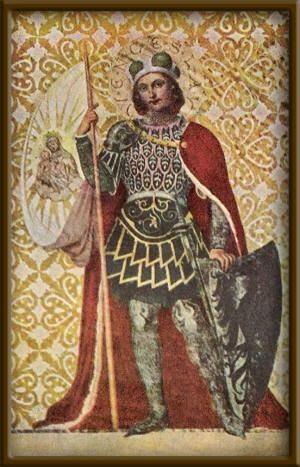 On the feast day of St. Vaclav, the holy relic is brought from Prague by the Arch Bishop of Prague and marched through the town of his murder, Stara Boleslav. That day is September 28th. The helmet is not complete; the upper part of the calotte is missing. This damage was done at some point in the course of previous centuries. Apart from the damage caused by hitting the helmet with a sharp object, the experts also discovered a flaw probably caused by the fall of the helmet. The helmet is on display at Prague Castle. 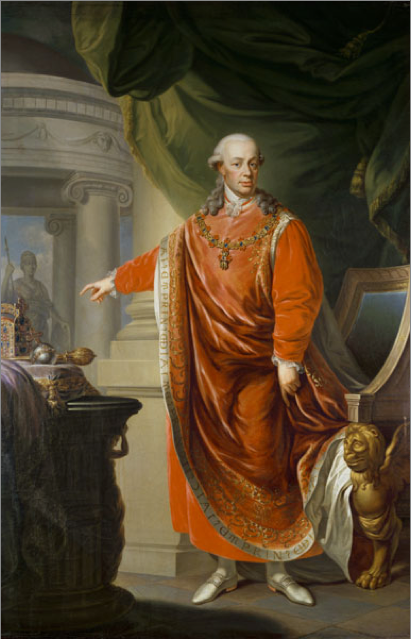 Emperor Leopold II as the king of Bohemia, among other titles. The Coronation Cloak, which has been preserved at Prague Castle, is made of luxurious silk material, called gold lily. A pattern of the cloth is made of a silk thread wound around a flat golden wire (purl). The design of the cloak itself is semi-circular, without sleeves, prolonged at the back to form a train. ​The last king to be clad in the Czech coronation attire was Ferdinand V when he was crowned the Czech king in 1836. Since then, the coronation apparel is only of historical and art-historical significance.